Terra Cotta Pit No.1 was discovered accidentally by local villagers in March 1974 when drilling for wells on a piece of barren land. They found some fragments of terracotta warriors and many bronze weapons, which received great attention from the relevant departments. The State Administration of Cultural Heritage sent a team of archaeologists and conservation experts to make field investigation and organized Shaanxi archaeologists to start a full-scale excavation of the site. In order to protect the find, a large arched hall with a steel frame was built above the pit in 1976. Covering an area of 19,136 square yards, the hall has provided the pit with good ventilation and daylight conditions. In addition, it is burglarproof and fireproof and has temperature and humidity monitoring systems. Inside the hall, Terra Cotta Pit No.1 is an east-west rectangular pit, measuring 252 yards long, 68 yards wide and 16 feet deep. There are five sloping entrances on both the eastern and western sides. Two side doors are installed on the northern and southern sides. Every three yards, there is a puddle wall, which separates the underground army into different columns. The walls were fortified with wooden columns, earth and reeds while the floor was covered with black bricks. Now visitors see the puddle walls were lower than the terracotta warriors, and it is because once the Pit 1 was taken in water which caused partial collapse of the walls. 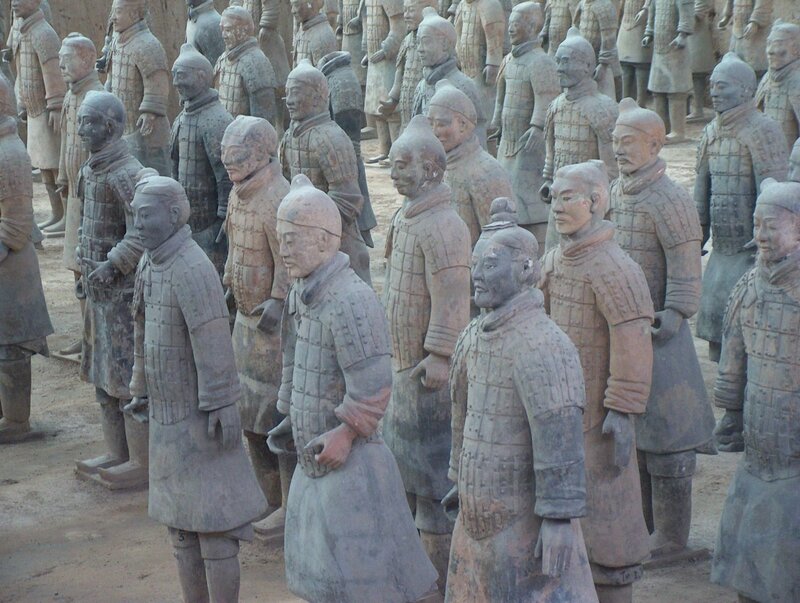 There are over 6,000 terra cotta warriors and horses in Pit 1, of which 1,000 have been unearthed. They are marshaled into a well-organized battle array composed of the infantry and cavalry. The vanguard includes 210 foot soldiers divided equally into three lines. The cavalry and war chariot follow close in line, forming the main body of the battle formation. The foot soldiers are alternated with the chariots drawn by horses, lined into 38 columns. On both the northern and southern sides of the war formation stand 180 warriors which serve as flank guards. The rear guards are on the western end, with two lines facing east and another facing west. Some soldiers are armed with battle robe, and some are equipped with armor.The war formation in Pit No.1 is elaborately set in a line and is posed so to seem prepared for battle at any moment. Every soldier and horse warrior is life-like, recapturing the formidable array of Emperor Qin Shihuang.One can only marvel at the grand artistic ability of the remote Qin Dynasty. Besides the terracotta warriors and horses, the cultural relic unearthed in the Pit 1 also include the bronze swords, spears, crossbows, arrows and Wugou. Wugou refers to a kind of swords which were produced in Wu State under the order of the King Helu. The edge of Wugou is curved and sharp. 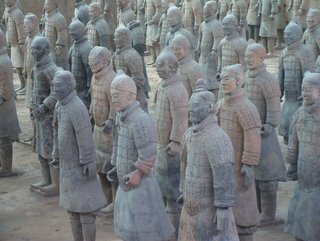 According to the history records, the construction of the terracotta warrior pits were started in 221BC and forced to stop during the peasant uprisings in 209BC. At the end of the Qin Dynasty, Xiangyu set fire to the pit, making the pit collapsed and many terracotta warriors and horses crushed, which is indeed a loss and pity of the great Qin terracotta warriors. The Terra Cotta Warriors and Horses are the most significant archeological excavations of the 20th century. Work is ongoing at this site, which is around 1.5 kilometers east of Emperor Qin Shi Huang's Mausoleum, Lintong County, Shaanxi Province. It is a sight not to be missed by any visitor to China.Upon ascending the throne at the age of 13 (in 246 BC), Qin Shi Huang, later the first Emperor of all China, had begun to work for his mausoleum. It took 11 years to finish. It is speculated that many buried treasures and sacrificial objects had accompanied the emperor in his afterlife. A group of peasants uncovered some pottery while digging for a well nearby the royal tomb in 1974. It caught the attention of archeologists immediately. They came to Xian in droves to study and to extend the digs. They had established beyond doubt that these artifacts were associated with the Qin Dynasty (211-206 BC). The State Council authorized to build a museum on site in 1975. When completed, people from far and near came to visit. Xian and the Museum of Qin Terra Cotta Warriors and Horses have become landmarks on all travelers' itinerary.Life size terracotta figures of warriors and horses arranged in battle formations are the star features at the museum. They are replicas of what the imperial guard should look like in those days of pomp and vigor.The museum covers an area of 16,300 square meters, divided into three sections: No. 1 Pit, No. 2 Pit, and No. 3 Pit respectively. They were tagged in the order of their discoveries. No. 1 Pit is the largest, first opened to the public on China's National Day, 1979. There are columns of soldiers at the front, followed by war chariots at the back.No. 2 Pit, found in 1976, is 20 meters northeast of No. 1 Pit. It contained over a thousand warriors and 90 chariots of wood. It was unveiled to the public in 1994.Archeologists came upon No. 3 Pit also in 1976, 25 meters northwest of No. 1 Pit. It looked like to be the command center of the armed forces. It went on display in 1989, with 68 warriors, a war chariot and four horses. Altogether over 7,000 pottery soldiers, horses, chariots, and even weapons have been unearthed from these pits. Most of them have been restored to their former grandeur.The Terra Cotta Warriors and Horses is a sensational archeological find of all times. It has put Xian on the map for tourists. It was listed by UNESCO in 1987 as one of the world cultural heritages.